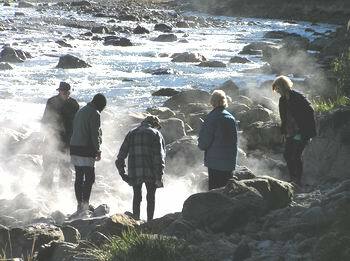 The St James Walkway is ideal for family groups or those who have just started out tramping. 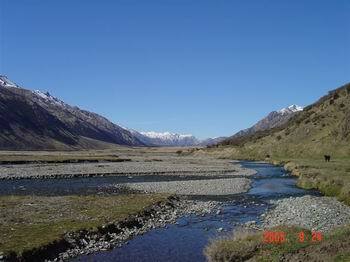 It's best to start from the Lewis Pass and finish at the Boyle River. To enjoy this trip allow at least 5 days. It can be popular in the summer months. 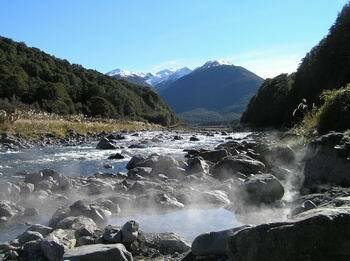 But doesn't attract the same large numbers as the Heaphy or Abel Tasman Tracks. 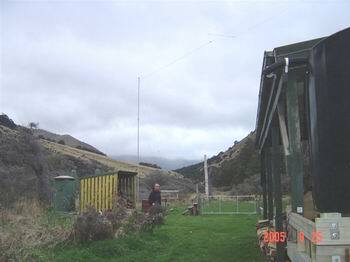 All the huts are large enough to cope with big groups. The track times are guides only and there's no first prize for beating them. Remember to allow yourself plenty of time to enjoy the views and manage to have a brew up next to a stream. I first tramped the St James soon after it opened. Not long after a huge storm blew a huge area of trees over in the Cannibal Gorge. We returned a couple of years ago and I was amazed with the regeneration of the bush after 20 years. I could still see the old logs laying in the bush. But if you didn't know about the storm damage. You would think the bush had always been there. Give nature time and it quickly reheals old wounds. 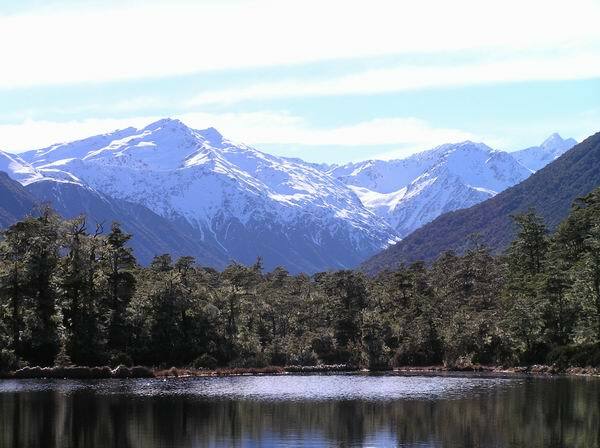 Winter tramping on the St James Walkway is probably my favourite time. (Families and the inexperienced shouldn't attempt this track in the winter). Although you pass over avalanche paths from Cannibal Gorge through to Ada Hut DOC have sign posted the danger areas. Of course I don't need to tell you not to linger when crossing these avalanche paths. Yes it can be cold but take the right clothing and it doesn't become a problem. Expect to have the huts and track to yourselves (plus the wild horses). 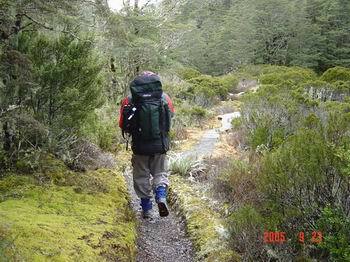 The St James is also a stepping stone to some of the harder multi day tramps through the Nelson Lakes National Park to St Arnaud. (check our trip reports for these different routes). 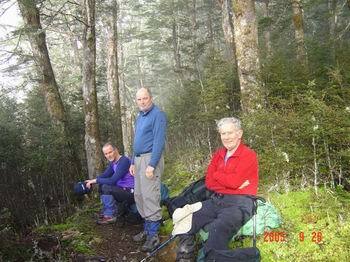 Supplied by Jim Murtha who along with Brian Wilkins, Paul Warren and Peter Gallagher walked the St James September 2005. 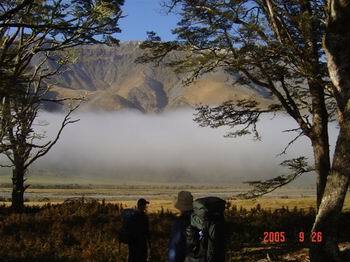 For some it was their first tramping experience. A great time had by all. The view from the Lewis Pass Tarn is really stunning and be assured the St James Walkway doesn't climb over the mountains in the above photo. 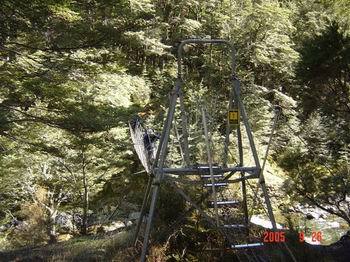 Take the time to fill out the DOC intention book and prepare your knees for the descent to the Cannibal Gorge swing bridge over the Maruia River. 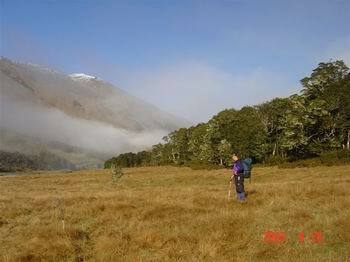 The track continues on the true right all the way to Cannibal Hut with plenty of views of the surrounding mountains. When the track first opened there was no Cannibal Hut and you had to slog your way to Ada Hut. So when you first pop out of the clearing and see the hut. Your shoulders are rejoicing and you are no longer arguing with yourself why you tramp.. It always amazes me how you have suddenly have spurt of energy and speed at the sight of a hut. 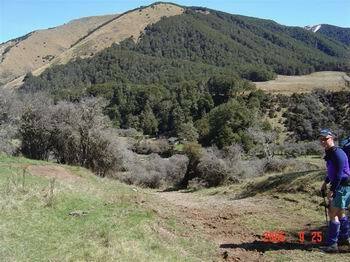 From Cannibal Hut the track climbs steadily up through the bush and popping out onto some lovely open terraces before crossing back over to the true left of the now small Maruia River. Ada Hut is only about 5 minutes further on. This hut would have to be my favourite on the St James. 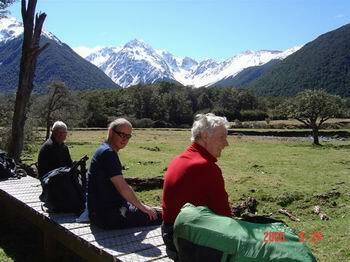 On a sunny day you can lose a lot of time lazing on the deck reading the hut book or just staring up into the head of the Maruia Valley planning future trips. 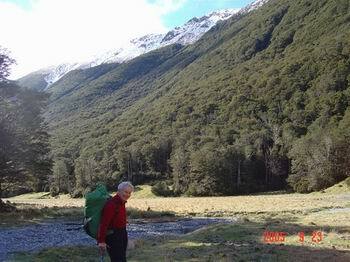 A lot of experienced tramping parties venture up the head of the Maruia and over Three Tarn Pass into the West Matakitaki Valley to Bobs Hut (the most remote hut in The Nelson Lakes National Park). 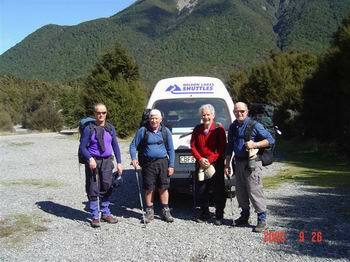 After about eight days they end up in St Arnaud ( read the Trip Reports). 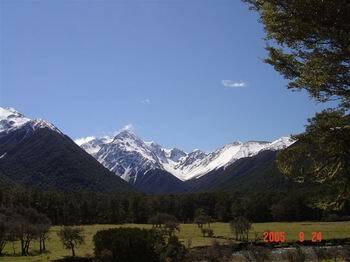 Click here for a good day walk from Ada Hut. 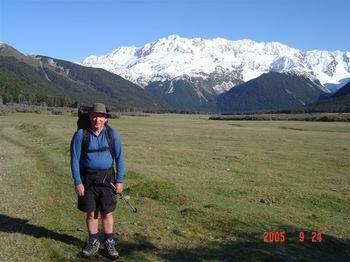 Great views down the Maruia Valley from the Tarns. Shortly after leaving Ada Hut you suddenly stumble on Ada Pass(938m). This pass is so low, if wasn't for the sign you wouldn't know it was there. 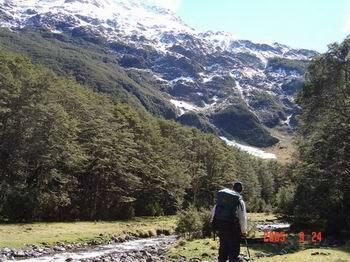 It's a easy ramble down the Ada Valley passing through beech forest and large tussock clearings. The mountain views are still with you all the way to Christopher Hut which is sited down stream from the junction of the Ada and Christopher rivers. The hut has great views up and down the valley. Often you will see wild horses grazing out on the river terraces. The old Christopher Hut is still okay to sleep in. But I noticed on our last trip the fireplace had been removed. 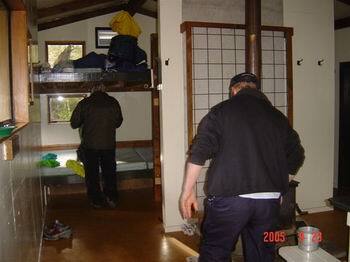 I once spent a comfortable night here sheltering from a snow storm. The only problem was that a large bull also wanted shelter from the storm and spent most of the afternoon trying to join us. Didn't worry me but my girlfriend wasn't too happy about sharing the hut. 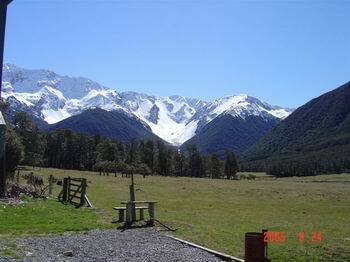 The route to Anne hut is mainly through wide open valleys traveling via 4WD tracks dodging cow crap and matagouri. But you have to expect this as you are traveling through a high country station. So a word of warning. Keep well away from the Ada Homestead, leave gates as you find them and try not to drive the cattle along in front of you (it wears condition off them and the farmer probably spent most of the day driving them up the valley). The owners are very private people and if you keep to the rules you will have no problems. As you get closer to the Henry River and Anne River junctions the scenery improves and you are no longer on a working farm but back in the mountains. 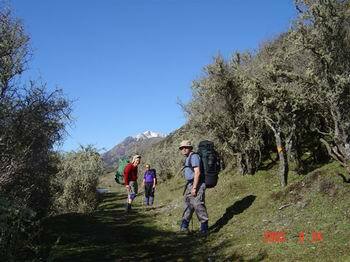 The Anne Hut is very comfortable and nicely situated next to the Anne river. The old Anne Hut is still standing as a reminder to how all the huts used to be. (not too many years ago before hut fees, that was the norm for a hut). 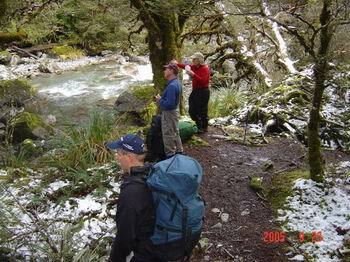 After leaving the Anne hut you must cross back over the footbridge and follow the Anne River up on the true right. It's refreshing to be back in proper alpine country. 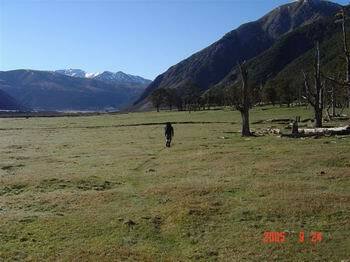 Leaving the matagouri and cow pats behind in the lower Henry River Flats. 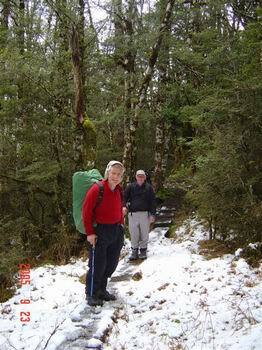 The climb up to the bush clad Anne Saddle(1135m) is not steep or difficult. 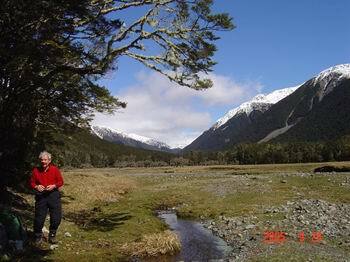 Although you are still below the tree line there's some good views into the headwaters of the Boyle River. There's a bit of a steep descent to the valley floor. Neither being too long or dangerously steep.From here on it's a lovely stroll down the valley, along river terraces and through many clearings. Along the way you pass the old Rokeby Hut (2 bunk). It's still in use and I wouldn't say no to staying there in a storm. 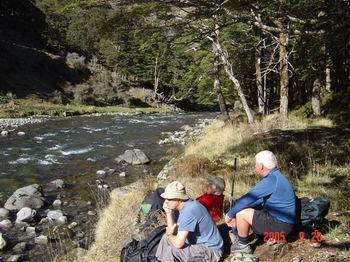 From the Rokeby Hut it's only another hour to the Boyle River swing bridge and the most welcome Boyle Flats Hut. They say this section should only take about 4 hours. But to me it seems to go on for ever. 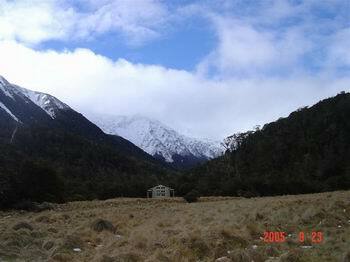 From the Boyle Flats Hut you must once again cross over the swing bridge to continue down the valley. 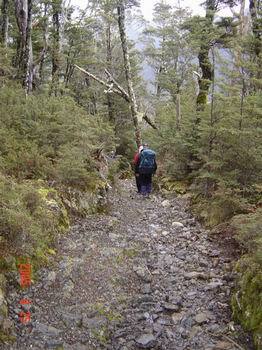 This section of the track is an old packhorse track which means easy travel. 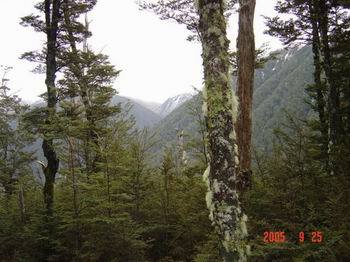 Crossing over a few tussock clad river terraces you are soon traveling through cool mature forest. 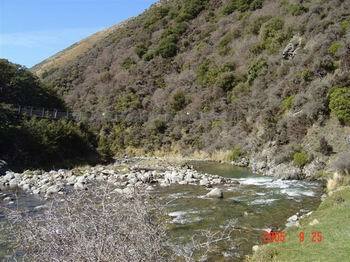 The track sidles high above the Boyle River to avoid the Boyle Gorge. The track is easy and you are soon winding down to the next swing bridge over the river. The Magdalen Hut is only about 15 minutes down stream from here and is a good alternative if you find the Boyle Flats Hut crowded. 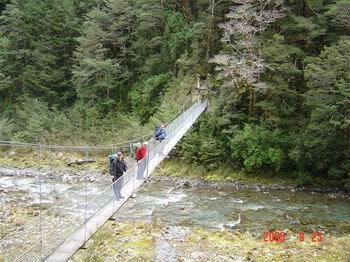 From the swingbridge you pass through more mature beech forest and large open river flats to the last swingbridge. It's now only another long hour to the road end and the most welcome Nelson Lakes Shuttles van. It's at this point your feet are yelling "are we there yet". 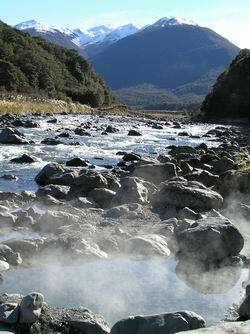 If you have time have a nice hot soak in the near by Sylvia flats hot pools.